SMALL ship cruising with just 350 fellow passengers aboard the Spirit of Adventure is selling through Cruiseco from now to the end of 2010, with cruises including escorted shore excursions in most ports and expert onboard lecturers to ensure guests get the very most from their adventure experiences. 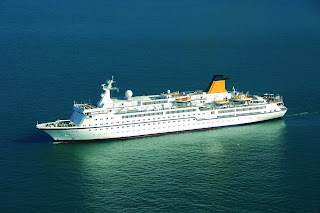 Spirit of Adventure cruises such diverse destinations as the Mediterranean, North Africa and the Arabian Peninsula, Asia, around the British Isles, and to Scandinavia, the maritime ports of the Hanseatic League, and the Crimea. All cruises are designed to take-in as much as possible of local cultures, wildlife, natural wonders and natural history, and range from 5- to 23-nights. And as well as offering some of the world's most amazing locales, Spirit of Adventure offers exquisite dining in a choice of formal and casual venues with wines included with lunch and dinner on select cruises, and nightly entertain-ment ranging from cultural shows by local performers to classic ensembles and recitals. Relics of the Red Sea cruise prices begin from as low as $1975pp twin-share for 7-nights return from the UK to the Red Sea, Jordan and Egypt including Cairo and the Suez Canal; cruises include all onboard gratuities and port charges. For cruises departing from Dover, Cruiseco includes complimentary return transfers between London Heathrow or London Downtown to Dover pier on the actual day of embarkation or disembarkation. For a detailed brochure phone 1800 225 656 or visit www.cruising.com.au for the name of your nearest Cruiseco travel agent.